Hey everyone! 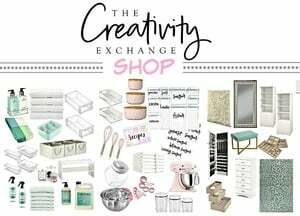 It’s Melissa from Design Eat Repeat and I’m excited to be over here sharing a mash-up of one of Cyndy’s favorite cake recipes with one of my springtime printables. If you’re anything like me, there is no discriminating when it comes to cake and it’s safe to say that all flavors are my cup of tea. 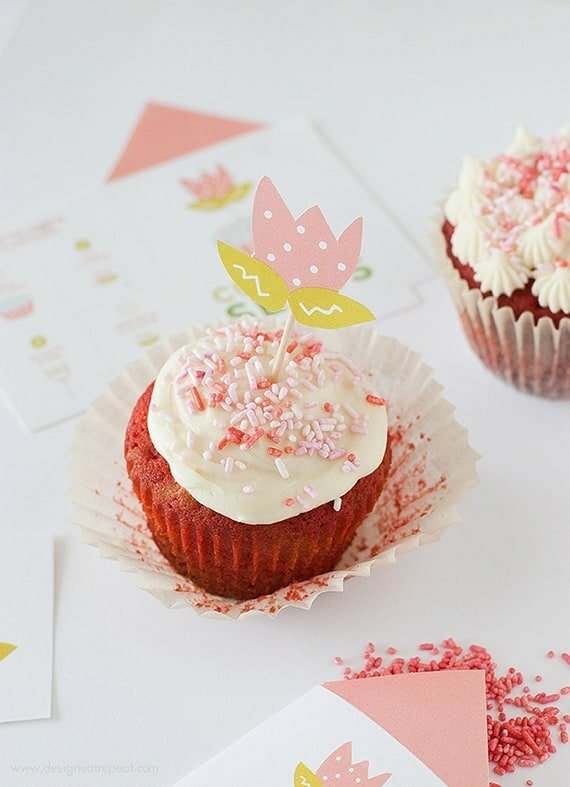 Today, I’m sharing a recipe for these jumbo red velvet cupcakes. So when Cyndy sent me the link to her father in law’s red velvet recipe that she posted a few years back, my eyes bugged out and I knew I had to try it. Being a Midwest gal, I’m always up for trying a sweet Southern recipe, and this one sounded like it would foot the bill. But being a DIY & printable guru, I wasn’t just going to make a average-joe cupcake! So I sat down at my computer & went to town creating a few printables to add along with it. Besides, all cupcakes need cute toppers, right? Right. 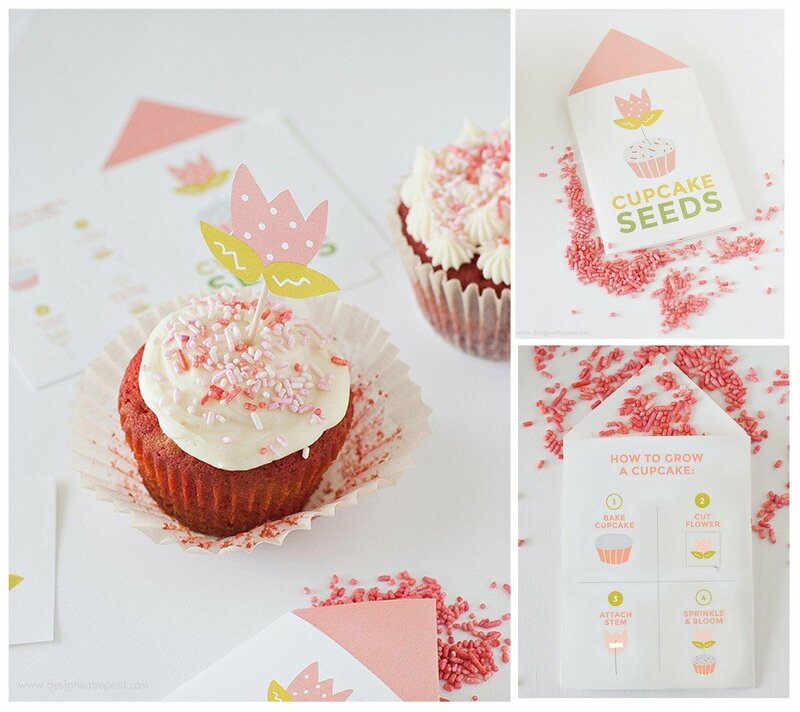 I designed the “Cupcake Seed” package to hold sprinkles, the tulip printable, and toothpick. You can put one at each place-setting for a party or just hand them out to friends for fun. 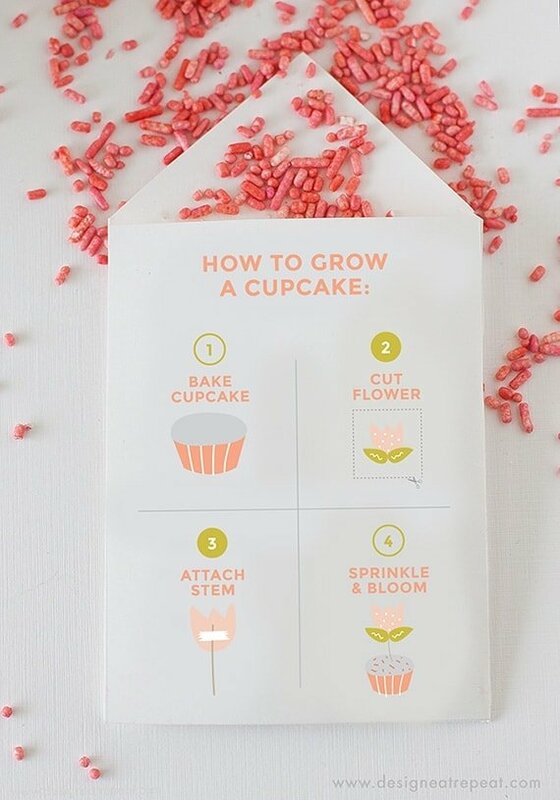 But the intention is that the recipient now has all the tools to “grow” a cupcake from drab to fab. Because I was in a illustration mood, I added some visual instructions to the back. 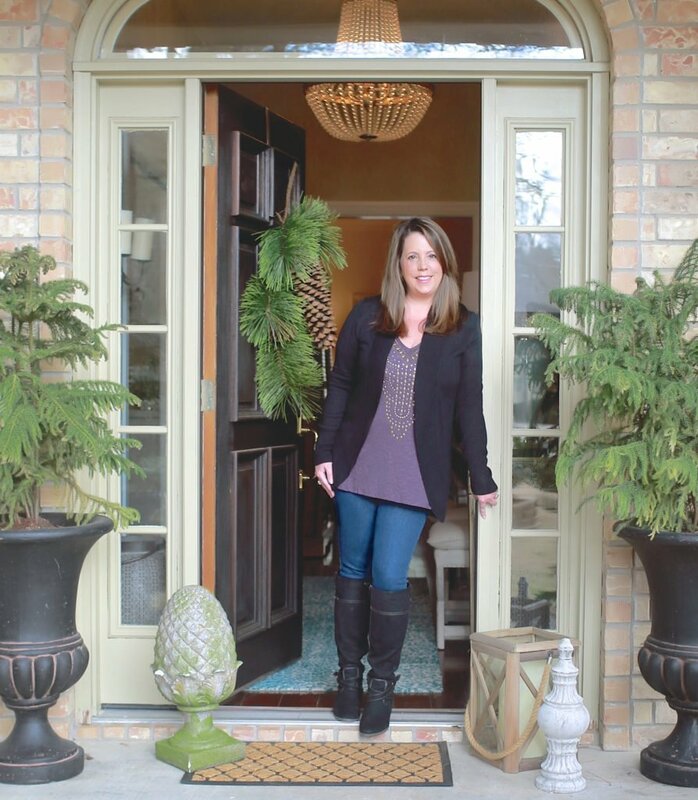 Decorating doesn’t have to take tons of time, and this project is here to prove it! 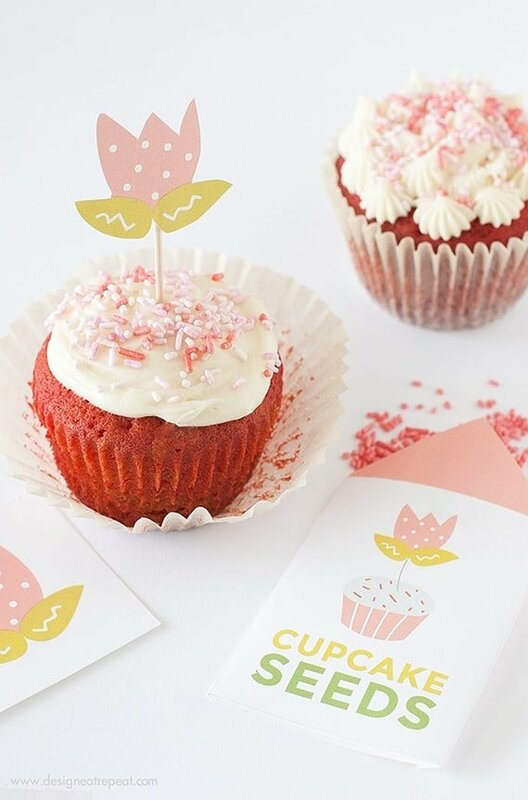 And although I recommend trying out Cyndy’s red velvet recipe, you can also make this DIY with a boxed cake mix. Whatever floats your boat! In a large bowl, sift flour, baking soda, and salt together. Set aside. In a separate bowl, cream together sugar, buttermilk, oil, and eggs on low speed for 30 seconds. Slowly add the flour mixture (on low speed) to the liquid mixture and mix until just incorporated. Next, add in vanilla, red food coloring, and vinegar and mix on medium speed until ingredients are well mixed (about 1 minute). For the cupcake size shown above, I used a jumbo cupcake tin and liners. Line the cupcake pan with liners and add 4 tablespoons of batter to each one. Bake at 350 degrees for 26-30 minutes, or until a toothpick comes out clean. Let cool. I hope you all enjoyed this little Spring time project! 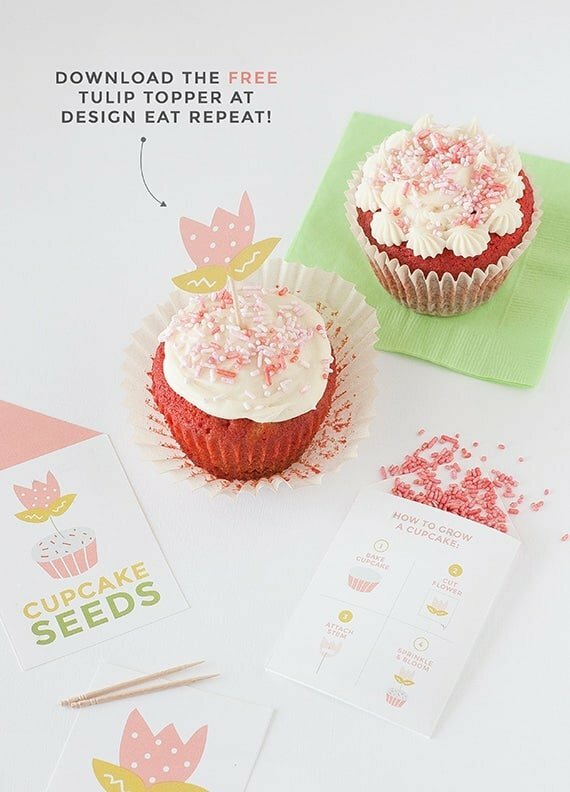 Hop on over to my blog to download the printabales & if you’re up for some springtime baking, find the Red Velvet cupcake recipe above! 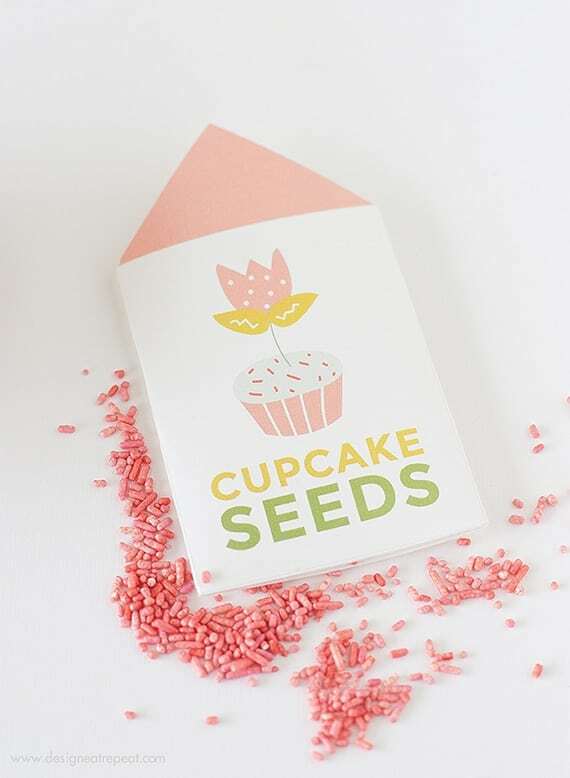 Oh my goodness these sound amazing, and the cupcake seed ideas is so cute! Thanks for sharing this recipe and printable. Melissa really came up with such an adorable idea. Thanks for stopping by Megan! I tried these today for a friend’s Birthday. They gave rave reviews for the flavor. I wasn’t sure about the omission of cocoa powder, but they had a great flavor, nice crust, and super moist inside. This is a winner.